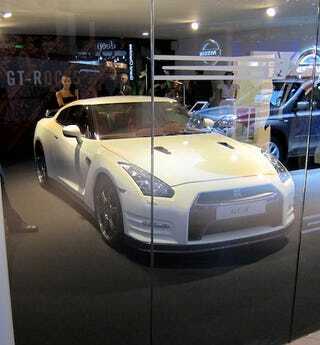 The updated 2012 Nissan GT-R made its bow at the Paris Motor Show, quietly biding its time away from the spotlight. The city of lights is no place for a lizard to go stomping. The styling changes up close amount to small refinements around the edges, like these LED driving lights and bumper strakes. There's some chrome around the hood vents, and a revised front headlamp assembly along with a few other tweaks. Nissan had a license to go further with styling changes, given what's reported to be a thorough reworking of the GT-R's chassis and handling. So far, Nissan hasn't put out any fresh details of its own.